Wednesday started out like any other day in the Sierra Nevada – sunny and calm. In comparison, the news kept talking about this “mega-storm” but were the warnings true? With no crystal ball handy, we would just have to wait until tomorrow. If it does show up, our schedule is clear, and we’re ready to get after it! Storm Lives Up To The Hype? As the alarm goes off, we look up to the skylights. The prior day’s sun is now replaced with snow. It falls gently from the sky with barely a wisp of wind in the air. The blizzard warning was supposed to start on Wednesday night but had now pushed to later this morning. 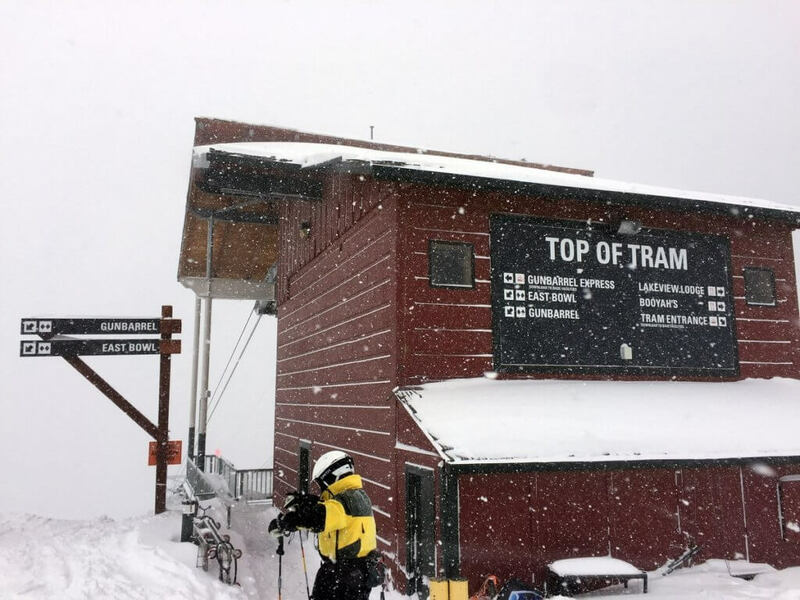 Would we have enough time to get a few pow turns in before the blizzard descended? Unsure what to expect, we decide to play it safe and stick close to home. Driving through Stateline, NV, the roads are eerily empty and the Heavenly Gondola stands motionless. Making the right turn onto Kingsbury Grade, we venture to our destination – the Stagecoach parking lot. As we make the final switchback, we only see a few people waiting at the lift. No one is here?!? YES! Throwing on our coats and grabbing our boards, we scurry over to the lift and ride up. The snow is perfect. Soft and creamy with a slight density so you can’t feel the corduroy underneath. After our initial run, we quickly get back onto the chair. The snow continues to fall at a leisurely pace, but we can hear the wind just across the ridge line. It sounds like a freight train! Chugga, chugga, chugga… we hear the colliding forces smashing into the other side of the peak. Will the wind stay on the other side of the ridge? On our fourth ride up, we’re given the answer. The snow begins to blow horizontally and the wind crests over the peak. The empty chairs ahead of us swing wildly. Here comes that blizzard! We’re now in full white-out conditions. We’re stoked to get a few turns in but it’s game over for today. The next day dawns with less wind and almost two feet of snow at lake level. Our excitement reaches a crescendo. The plan is to head up to Sierra-at-Tahoe and meet up with our good friend Matt Palacio. Filling up the gas tank, I receive a text from Matt. A snowplow has fallen off the road due to the treacherous weather and Caltrans is unsure of when US-50 will re-open. Yikes! Instead of waiting in line at Meyers, we opt for plan B. We’re heading over to Cal. 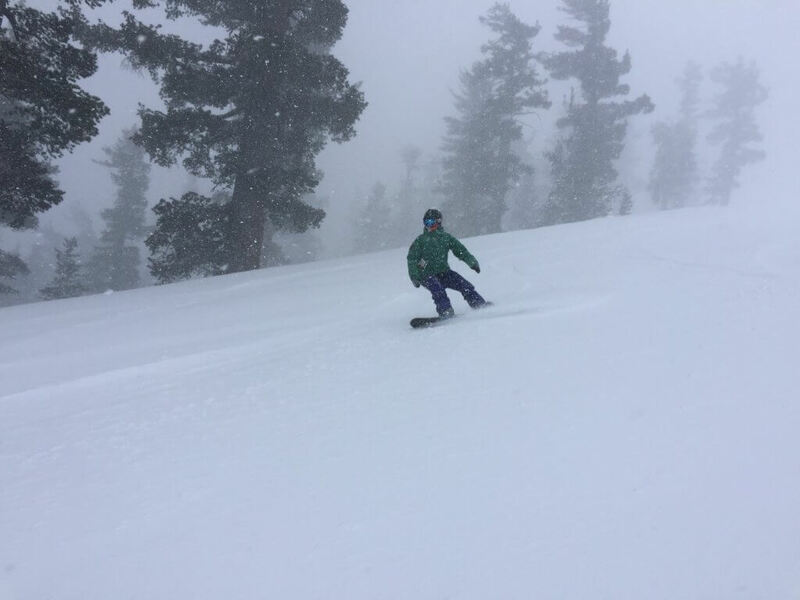 Lodge at Heavenly to enjoy what the storm has brought. Driving through the snow-covered roads, we make it to the base and join up with Matt. Trudging over to Gunbarrel Express, we look up the mountain. Our jaws drop! Just 48 hours ago, Gunbarrel was filled with bushes and rocks. 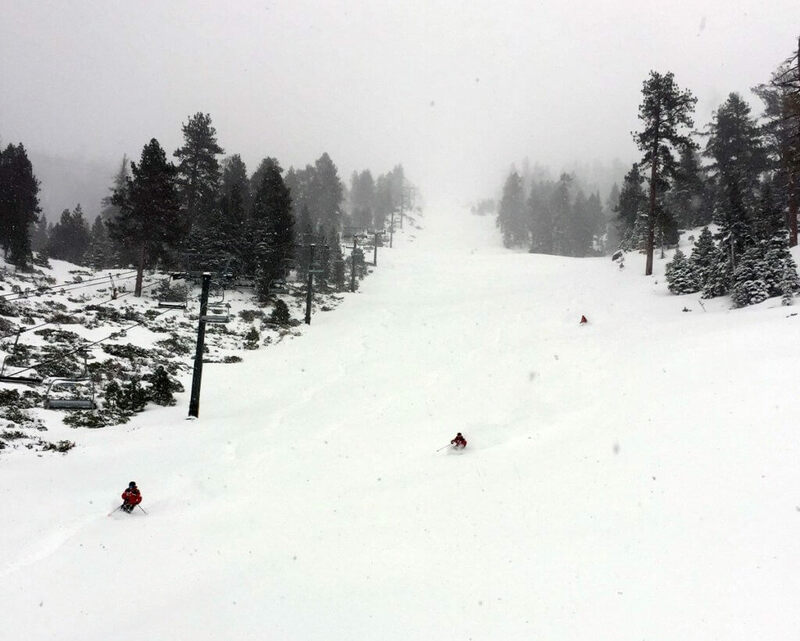 Now… we’re welcomed to a steep face filled with powdery goodness. We watch closely as ski patrol descends. Each of their turns is greeted with a massive face shot. Hundreds of people gathered at the base roar in unison. Looking at each other, we know what the plan is: Gunbarrel all the way! A few minutes before 9:00 am, ski patrol gives the nod and soon it’s our turn to head up. Making it to the top, I take a second to try and embrace the moment. I know this is going to be the run of the day and wanted to feel everything. I point it straight and make my first big turn. The snow crystals immediately engulf me. I continue to enter the white room over and over. The excitement is too much for me to hold in and I holler at the top of my lungs. Pulling up to the bottom, we all slap high fives grinning ear to ear. Looking back up, we watch hundreds of skiers and snowboarders chew up the snow to oblivion. The scene reminds me of watching locusts devour a countryside. After hitting the face a few times, we head over to Canyon Express. The swarm of humanity waiting hums like a beehive with voices echoing off the snow. This is not what we expected on a storm day. Instead of waiting for one run every thirty minutes, we head back to Powderbowl and get some of the scraps until the crowd descends onto that lift as well. With the storm expected to pick up again tonight, we decide to leave and head out early to Sierra the next day. 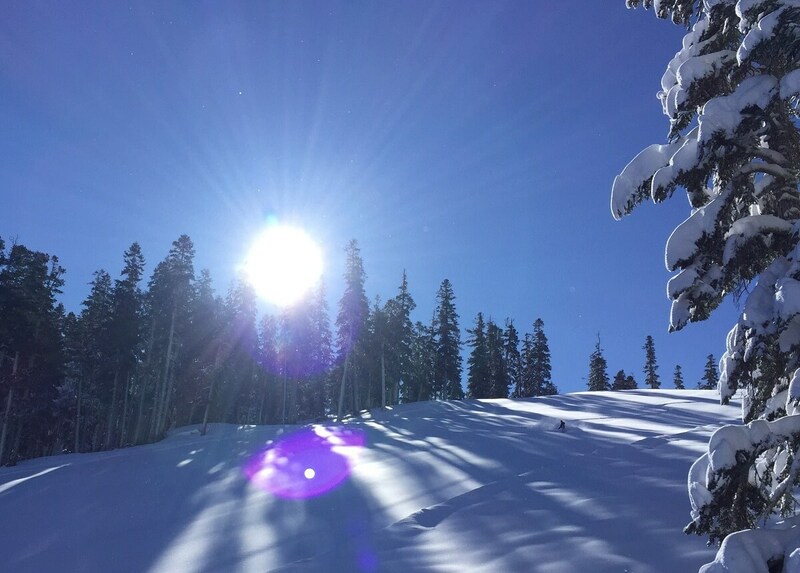 With Saturday’s sunrise, we’re again blessed with another eighteen inches of snow. Jaime and I look at each other and grin. Sierra is going to be off the hook! 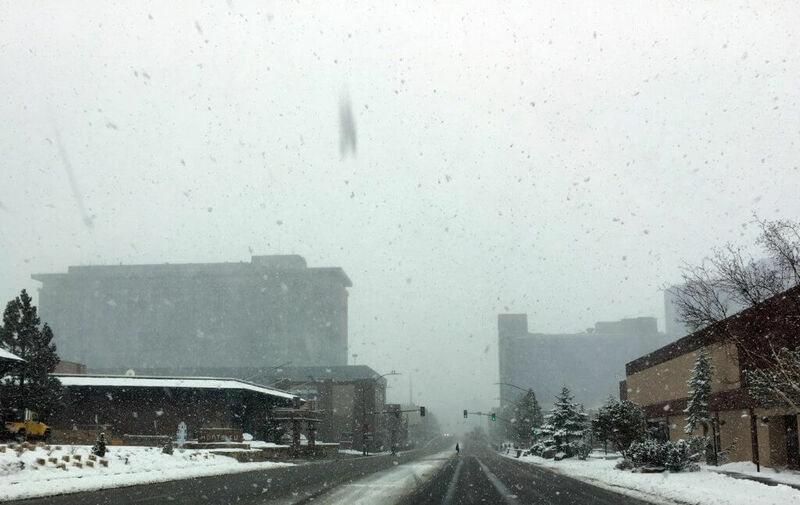 Entering Meyers, we’re shocked to see only a handful of cars heading towards Sierra-at-Tahoe. On the other side of the road, a sea of cars floods into South Lake Tahoe going towards Heavenly. We know it’s a Saturday, but we pray that it won’t be too crowded where we’re going. Arriving at Sierra, we look down to the bottom of Grandview Express and see only a few dozen early birds. Our hearts leap with joy. After a few moments in the queue, we hear ski patrol yell, “Alrighty folks. We’re on snow safety hold and don’t know when we’ll be opening up Grandview. 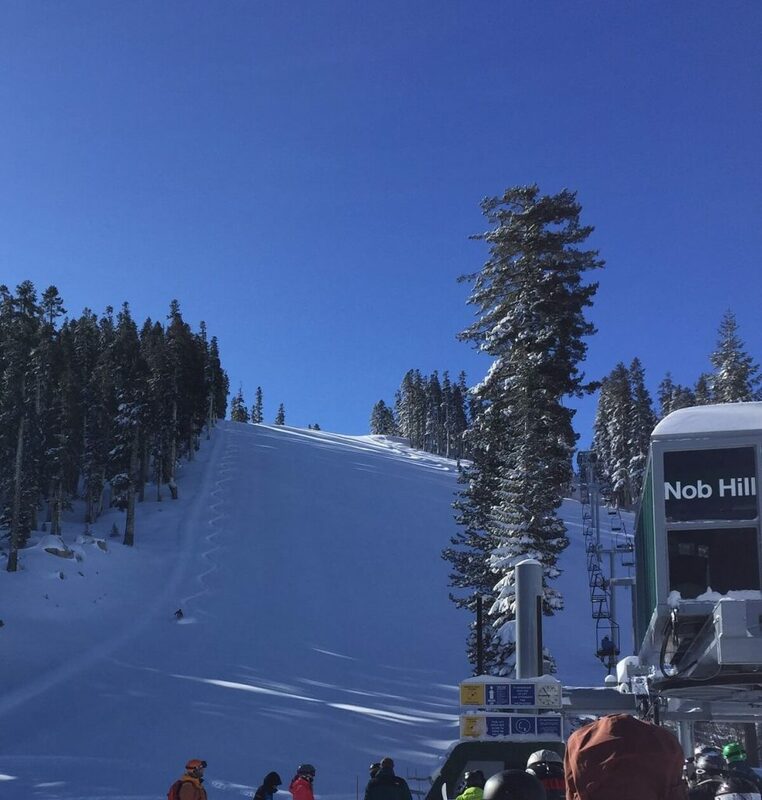 We suggest heading to Nob Hill and hit up West Bowl.” No anger or frustration breaks out as we all know the drill. Just happy to be in the snow, the entire crowd turns and heads over to the other lifts. At Nob Hill, smiles and positive energy greets us. Even though no one knows each other, people strike up a conversation with their neighbors. The talk revolves around the inbounds avalanche at Squaw Valley and the snow plow falling off the road. Looking up, we see ski patrol drop into the main run in front of us. Instead of tracking out the entire face, he stays to one side and makes tight, clean turns so that everyone can enjoy it. Talk about respectful! Making it to the bottom, the patroller yells to the lift operators “We’re good to go!” The crowd shuffles onto the lift and we get to our turn. Ascending high in the air, I suddenly feel my phone vibrate. Taking a quick look at the text, it’s only 8:53 am and Heavenly’s lot is already full. Wow, that’s early! We know we made the right decision to come here instead. We decide to head over to the same run as ski patrol. In comparison to yesterday’s massive sea of people at Heavenly, today there’s only a handful of us on the trails at Sierra. Taking a deep breath, we soak in the moment and dive into the slope. Leaning back just slightly, I let the board do all the work. Shifting my weight from side to side, the board bounces out of the snow at each crux of the turn. The untracked snow and blue bird skies make it feel like I’m surfing the mountain. With each turn I can hear people from the lift cheering me on. Yet another reason why we love Sierra-at-Tahoe… it’s about enjoying the moment as a crew. We arrive back at the base to see no one around. WHAT?!? We quickly grab the next chair and ride up again. We continue to explore our home mountain finding stashes everywhere. At around 10:30 am, the crowds do begin to show, but it’s still nothing like we experienced yesterday. We continue to take lap after lap finding incredible snow in every direction. 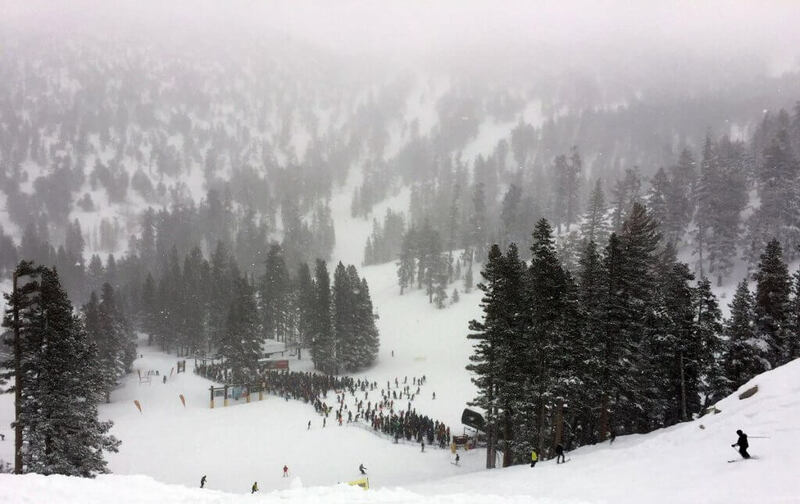 Instead of the crowds stopping us from shredding, it’s our legs that beg for mercy. Slapping high fives, Jaime and I look at each other and have the same thought. This is why we call Sierra home. The people, the mountain, the vibe and of course, the amazing non-GMO snow. What a way to finish chasing the storm. 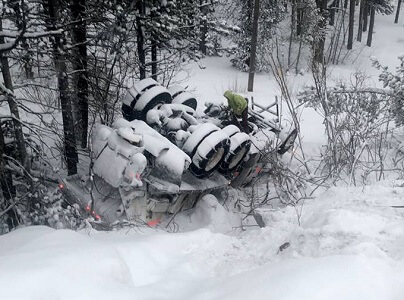 Great article — did not know of the snow plow going off the highway — hope he was not injured.